NOTE: Fentanyl is an opioid pain medication with a rapid onset and short duration of action. Fentanyl is 50 times stronger than heroin and 100 times stronger morphine; also, some fentanyl analogues, which are designed to mimic the pharmacological effects of the original drug, may be as much as 10,000 times stronger than morphine. (by Sarah N. Lynch, Doina Chiacu, Reuters) WASHINGTON – The U.S. Department of Justice has indicted two major Chinese drug traffickers on charges of making illegal versions of fentanyl and selling the highly addictive drug to Americans over the internet and through international mail. [Federal prosecutors made the announcement on Tuesday, October 16]. The Chinese suspects were charged in separate indictments unsealed on Monday in Mississippi and North Dakota. “For the first time, we have indicted major Chinese fentanyl traffickers who have been using the Internet to sell fentanyl and fentanyl analogues to drug traffickers and individual customers in the United States,” Deputy Attorney General Rod Rosenstein said in a statement. The United States does not have an extradition agreement with China. 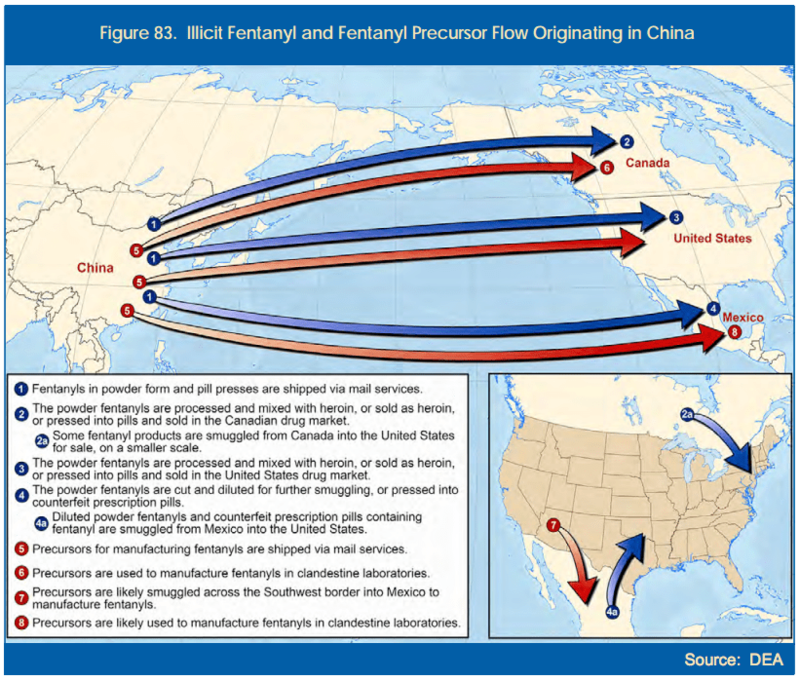 “We believe that most, if not all, fentanyl that is distributed here in the U.S. and in Canada, originates in China,” Rosenstein said, noting that China must do more to crack down on labs making the drugs. Yan operated at least two chemical plants in China that were capable of illegally producing “ton quantities” of the drugs, and evaded detection by systematically altering their chemical makeup, the Justice Department said. Investigators identified more than 100 distributors in the alleged scheme. Zhang is accused of operating at least four labs in China and selling to U.S. customers over the internet. He is accused of sending “many thousands” of packages since January 2013, the government said. Five Canadians, two residents of Florida and a resident of New Jersey were also charged in connection with the alleged conspiracy involving Zhang, the department said. The United States is dealing with a major epidemic of opioid overdoses. In 2016, the Centers for Disease Control estimated that 20,000 Americans were killed by fentanyl, a highly addictive synthetic painkiller. According to law enforcement officials, the drug is 50 times more potent than heroin and 100 times more potent than morphine. The President’s Commission on Combatting Drug Addiction and Opioid Crisis, chaired by New Jersey Governor Chris Christie, has a deadline of November 1 for its final report on the epidemic and recommendations it will pass along to the drug industry, with the objective of innovating pain management and addiction prevention measures. Prior to that deadline, President Trump implied that he would probably formally declare the opioid crisis a national emergency with an event next week. Read "Police officer accidentally overdoses on fentanyl after making drug arrest"
Fentanyl was first made by Belgian physician Paul Janssen in 1960. Janssen developed fentanyl by testing chemicals similar in structure to pethidine(meperidine) for opioid activity. The widespread use of fentanyl triggered the production of fentanyl citrate (the salt formed by combining fentanyl and citric acid in a 1:1 stoichiometric ratio), which entered medical use as a general anaesthetic under the trade name Sublimaze in the 1960s. In the mid-1990s, fentanyl was introduced for palliative (end of life) use with the fentanyl patch, followed in the next decade by the introduction of the fentanyl lollipop, dissolving tablets, and sublingual spray which are absorbed through the tissues inside the mouth. As of 2012, fentanyl was the most widely used synthetic opioid in medicine. In 2013, 1,700 kilograms (3,750 lbs) were used globally. Fentanyl has a relatively wide therapeutic index (270) which makes it a very safe surgical anaesthetic when monitored carefully; however, its potency requires careful measurements of highly diluted fentanyl in solution. Fentanyl patches are on the World Health Organization's List of Essential Medicines, the most effective and safe medicines needed in a health system. Fentanyl is illegally made and used as a recreational drug often disguised as other medications or mixed with heroin, leading to thousands of overdose deaths from 2000 to 2017. Deaths have also resulted from improper medical use. The naturally occurring opiates are those which are found in the opium resin of the opium poppy. Although there are over 25 different alkaloids present in opium, morphine and codeine are the only two that are used as narcotic opiate analgesics. All other opioid analgesic medications are either semi- or fully-synthetic and are not found in nature. The semi-synthetic opioids such as hydrocodone, hydromorphone, oxycodone, and oxymorphone are derived from the naturally occurring opiates and opium alkaloids (morphine and thebaine especially).